Le Ranc Davaine is a 5 star campsite located in Saint-Alban-Auriolles in the Ardeche region of France. 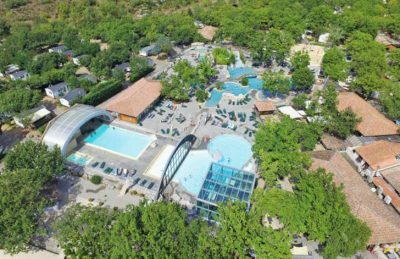 Le Ranc Davaine is the perfect place for a family holiday offering visitors a quality location combined with plenty of activities on site and nearby including a fabulous swimming pool complex. Set within 13 hectares of beautifully landscaped grounds, Le Ranc Davaine is a superb 5 star quality campsite that is probably one of the best in the area. The natural surroundings of the campsite allow visitors to walk or cycle to their hearts content and the fantastic array of things to do mean that you’ll never have a dull moment. One of the great things about the campsite is that it’s located alongside a stunningly beautiful, slow running river. The river means that you can either find a shady spot where you can sit back and relax if you feel the need or take part in a variety of activities. The pebble beach is perfect for those families wanting somewhere the kids can play whilst the river is also perfect for those families wishing to splash around in the water or canoe for a short trip further downstream. Whether you’re looking for somewhere for your active holiday or prefer to relax and unwind you’re sure to have a great time at Le Ranch Davaine. The spa is perfect for those wanting to just sit around and the activities on offer are great for the more active. If you love swimming pools then you won’t be disappointed by whats on offer at Le Ranch Davaine. A 2500m2 water paradise awaits you at the campsite, where you’ll find a number of swimming pools for a variety of ages, water slides, water falls, a water games area for younger children and of course some lovely sun terracing where you can sit back and relax in the warmth of the summer sun. Le Ranc Davaine campsite offers a comprehensive selection of activities and facilities on site and also nearby to ensure you have a fantastic family holiday. On-site activities at Le Ranc Davaine campsite include tennis, table tennis, football, badminton, basketball, volleyball, fishing, canoeing, playground and cycle hire. Facilities available at Le Ranc Davaine campsite include WIFI, restaurant, snack bar, takeaway, bar, groceries, games room, tv room, animation team, washers and dryers. Accommodation at Le Ranc Davaine campsite includes a range of 2 and 3 bedroom mobile homes that are available from Eurocamp.